After years of online debates, countless rumors, and a multitude of setbacks and hold-ups, the new “RoboCop” reboot has been made. Directed by documentary filmmaker José Padilha, and written by a group of men responsible for “Gran Torino,” “The Amazing Spider Man” and “Road to Perdition,” the film has some amazing talent helping it along. From the beginning, this reboot has had much controversy from the start; the film started pre-production in 2005 and was then halted, in 2008 it was announced the project had been revitalized and Darren Aranofsky was slated to direct. It was put on hold and its release date pushed back three or four more times. What is about this movie that has had multiple movie studios put this film on a shelf for so long? Is it a lack of confidence or are they possibly taking their time to craft a truly great futuristic sci-fi picture? Well, some of these questions are being answered as we get our first look at some footage from “RoboCop” in this very first teaser trailer. While you are probably familiar with the storyline of the original 1987 original, this is not a direct reboot, but a re-imagining of the characters. My first thoughts are that it has many familiar elements that I recognized from the original, along with some updates. While I am not the biggest fan of the original trilogy of films, I have watched them numerous times. Since the films came out when I was a child, I am not as attached to all of the original ideas and concepts, like some who had them be a major part of their teens and young adult years, so I am more open to the idea of updating. The new suit looks like a cross between the “Tron: Legacy” outfits and KITT, the car from “Knight Rider,” which is not necessarily a bad thing. One of the biggest changes I can see is that while the original “RoboCop” movies were gritty and ultra-violent, which made them get R ratings, this upcoming film is going to be rated PG-13, which is a major disappointment to some people. The aspect of this trailer that gets me the most excited, though, is the colorful cast. Joel Kinnaman is playing Alex Murphy — who ends up becoming Robocop — and his wife is being portrayed by Abbie Cornish. But here’s where the cast gets really interesting: Michael Keaton will be playing one of RoboCop’s designers; Gary Oldman is one of the doctors who oversees his transformation from human to the cybernetically enhanced crime fighter; and, of course, Samuel L. Jackson is playing some sort of shadowy political figure. I hope it won’t turn out to be the case, but one of the first things I thought of after watching the trailer for the first time was the failures of last year’s “Red Dawn” and “Total Recall” remakes. I won’t hold that against the film yet, though, and remain open-minded about seeing more before I pass judgment on the film. So what are your thoughts on this trailer and the movie in general? Are you in favor of it or do you want Hollywood to leave classic nostalgia films alone and come up with some new ideas? Leave your comments and let us know. 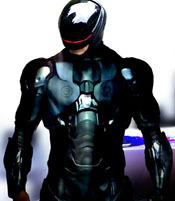 “RoboCop” is slated to hit theaters Feb. 7, 2014. It also stars Jay Baruchel, Jackie Earle Haley, Marianne Jean-Baptiste and Zach Grenier.